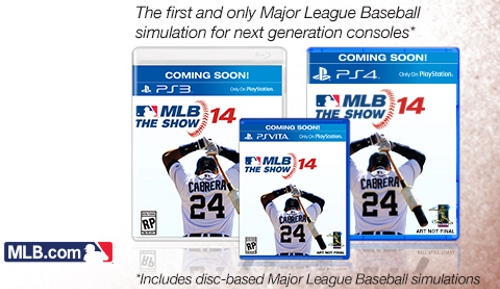 Along with the official announcement of MLB 14: The Show and cover athlete Miguel Cabrera SCEA slipped in the declaration that the PS4 game is “the first and only MLB simulation for next-gen consoles” which confirms widespread speculation that the Xbox One will not have a baseball game to offer next spring. The timing is ideal for Sony who can publicly tout this as a clear advantage over Microsoft in advance of the two consoles releasing later this month. Interestingly the image does leave an opening for a discount digital download or arcade baseball game…as unlikely as either might seem right now. It is noted that the statement applies only to “disc-based MLB simulations”. The MLB 2K series had been cancelled in 2012 only to later be resurrected by an extension of a year to the third party contract with much friendlier terms. It left only a few months to produce MLB 2K13 explaining why the game was practically a carbon copy of 2K12. That reprieve was short lived and 2K Sports had no interest in moving the series to next-gen. There have been no indications of another party (EA Sports, Microsoft, any others) striking a deal with MLB. The leagues demands have been deemed exorbitant following the lucrative deal with 2K Sports that came dangerously close to sinking the whole division. That means the absence on the Xbox One could very well stretch beyond just next year.